Several of our family members have food allergies. The list of foods that are okay for snacks in our house is pretty slim it seems. With gluten and corn being off limits it’s sometimes difficult to think of fun snacks that are healthy, taste great, and easy to put together. 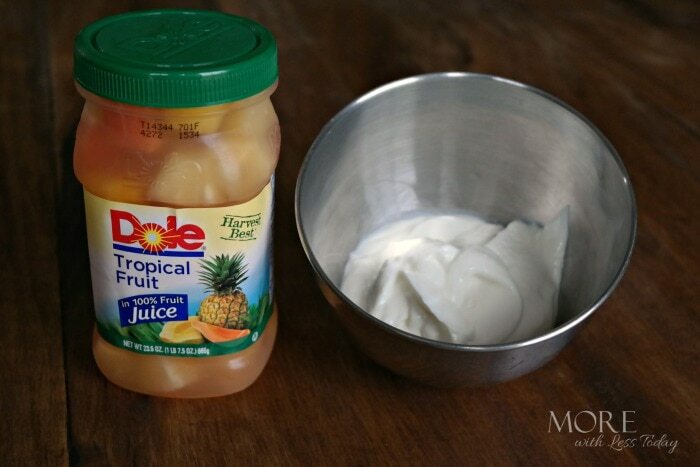 Combine the DOLE Tropical Fruit and the Greek Yogurt in a bowl, making sure to include some of the fruit juice. The DOLE Jarred Fruit requires no peeling, cutting, or mess. It’s packed in 100% fruit juice and ready-to-eat. Because the jarred fruit has a resealable lid, you can remove only the 3/4 cup of fruit needed for this recipe and return the rest to your refrigerator. While I used the Tropical Fruit variety, DOLE Jarred Fruit is also available in Sliced Peaches, Pineapple Chunks, Mandarin Oranges, Mixed Fruit as well. 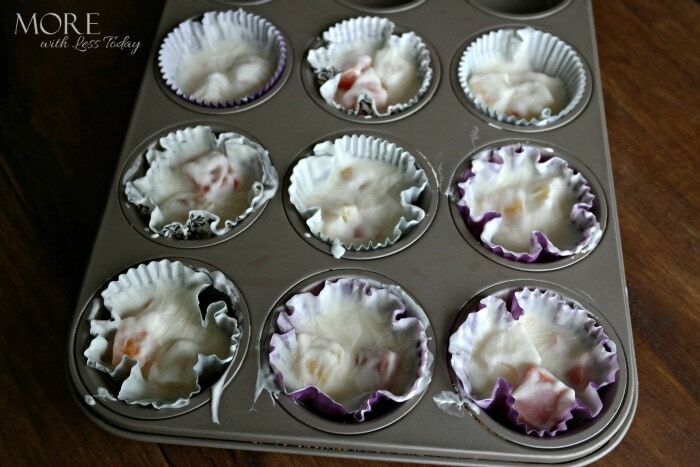 Line your muffin tin with the cupcake wrappers and spoon a generous amount of the fruit and yogurt combination into each wrapper. 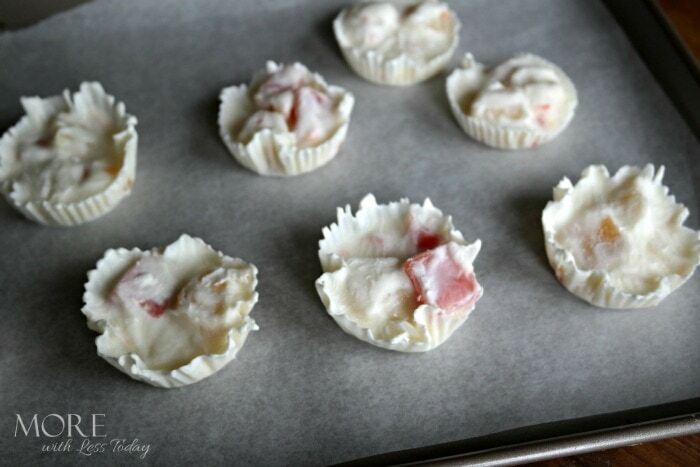 Place the muffin tin into the freezer and allow the yogurt bites to freeze for 2-3 hours. Remove and serve! Each jar of DOLE Jarred Fruit contains 5 full servings of fruit and is naturally fat-free and cholesterol-free for a snack I can feel good about feeding my family. 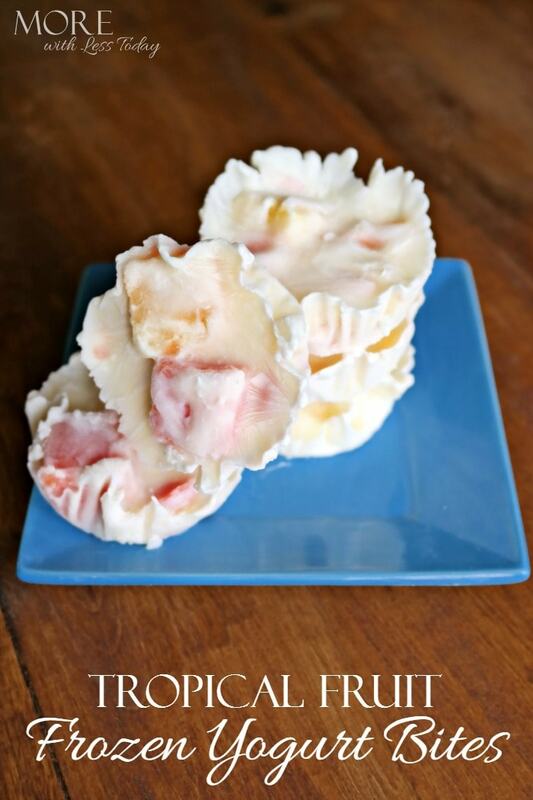 Found in the canned fruit section at most grocery stores, DOLE Jarred Fruit retails for around $2.99 a jar making frozen yogurt treats with fruit a great snack option. This is a sponsored post written by me on behalf of DOLE Jarred Fruit. All opinions are 100% mine. I bet the kids would like these. It’s so hard to find good, healthy snacks for them. These sound like they would be rather tasty, and a bit refreshing on a warm day. I like that they are easy to make. This looks amazing! I like when my daughter asks for healthier snacks, and yogurt is one of her favorites. I am sure she would love this frozen version. These are perfect snacks for our daughter. She is a huge fan of fruit and yogurt. I can make this for her Halloween party at school!